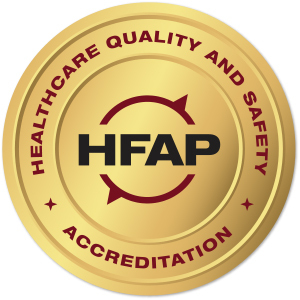 Rome Memorial Hospital is accredited by the Healthcare Facilities Accreditation Program, which is authorized by the federal Centers for Medicare and Medicaid Services to validate our compliance with recognized national standards for patient safety, quality improvement, and environmental safety. At Rome Memorial Hospital, we pride ourselves in our continuous efforts to enhance the care delivered to patients by fine-tuning our processes and adopting the most current evidence-based practices that prevent errors, reduce inconsistencies in medical care, and improve patient outcomes. We regularly review our performance and develop action plans to enhance patient care. With current data, we are able to compare our performance against state or national benchmarks and identify emerging trends to refine our processes in a timely fashion. We assemble cross-functional teams to review the current research, examine our procedures and develop strategies to achieve our goals. Rome Memorial Hospital’s commitment to quality and patient has been validated by independent agencies. The hospital has been recognized as a leader in infection prevention. Advanced software minimizes radiation exposure during CT scans while providing physicians with quality images. Our Health Information System provides clinical decision support to standardize care and advance patient safety. Medication bar-coding helps ensure the right patient receives the right medication at the right time. Our Rapid Response Team saves lives by responding to early warning signs. Nursing calls high risk patients after they go home to guide them through their recovery. With feedback from patient focus groups, we’re creating a more restful environment with new beds and personal headsets.